Last Sunday I went to a local “Health and Wellness Expo.” These are always…interesting. Largely, they’re an avenue for the local home-based businesses (danger! danger! MLM Vultures Ahead. Do not smell of desperation, gullibility, or financial insolvency!) but occasionally you can find some things worth the price of admission. Back to the powders. Normally, I’m not a proponent of manufactured nutrition. Food should be…well, FOOD. A tub of chemicals can’t be as good as what God made for us to eat, can it? All those weird chemical-sounding things make me uneasy. Besides – I want to CHEW my food. Okay, I know that this is manufactured self-righteousness. With all the abuse I’ve dealt my body over the years – gallons of diet soda and boxes of diet pills between bouts of binging, purging, and starvation, I’m going to worry myself over an eight-ounce shake? I suppose if I’m completely honest with myself, I’m really afraid that I’ll drink the “meal-replacement” and it’ll make absolutely no dent in my appetite…so I’ll have to eat an actual meal anyway. My waistline does not benefit from drinking my calories. My brain just doesn’t get that “you’ve BEEN fed, now shut up until lunchtime” when it drank dinner. I did sample one of the powders. Why? Why do I do this? I KNOW how this is going to go. It will taste terrible and I’ll stress myself out for the rest of the day wondering 1) how many calories that thing had and 2) what chemicals I drank and if they’ll further eff up my already-craptacular metabolism. But I do it anyway. But this? Couldn’t drink it. The vendor told me that I probably didn’t like it because it was mixed with vanilla almond milk, and THAT was actually what I was finding too sweet. (Oooookay.) She also admitted that they sold a lot more of the stuff when they mixed it with sweet bases like this. “The American palate has a certain…expectation, you know? And we have to make things that people can actually see themselves drinking day to day.” She’s probably right. I’m sad for America, but she’s right. Incidentally, the vendor had a concentrated tart cherry juice, as well. That was way more my speed. It was not unlike wine. Wine is good and is part of what’s right with the world. And supposedly, tart cherry juice helps with melatonin production, so could help one sleep. I’ll have to research that another time, but I’m not terribly optimistic that there’s a fruit on the planet that can silence the voices in my head. I spent some time at the crystals booth (yeah, they had jewelry, too, of course.) This whole arena fascinates me. I don’t fully understand how crystals work, exactly. You hold them while you meditate? Wear them? (The pretty ones, anyway.) Place them on your body, or under your bed? Stare at them and pray? I truly don’t know. But I did spend some time reading – this stone is good for relaxation, that one helps release creativity. The blue one will calm anxiety and the red one will reduce stress. Now, I do carry a pretty sizable purse, but sadly, I don’t have a bag, nor strong enough shoulders, to carry all the rocks I apparently need. I’m getting a vision of that dead dude in A Christmas Carol, hauling around those giant chains. Except mine would be rocks, albeit pretty rocks, and I’d have a much nicer death robe to wear, and totally dope shoes. So, no crystals for me, at least not today. 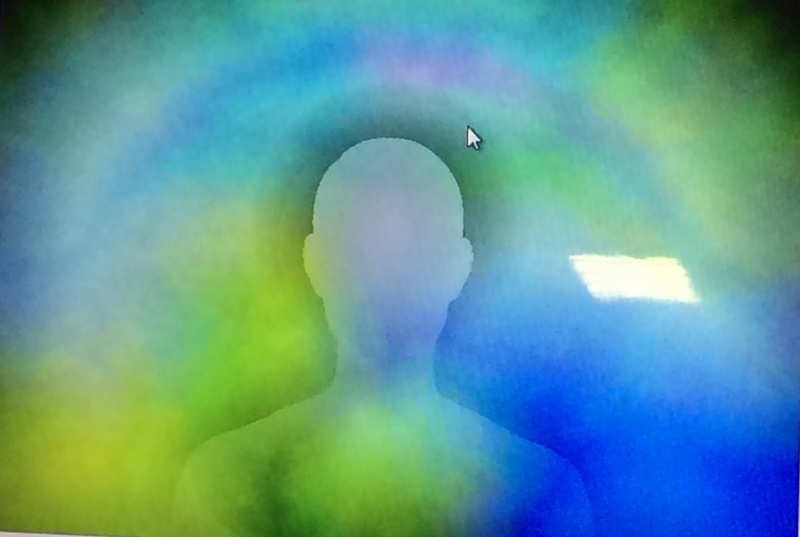 But I did walk away with one small piece of enlightenment: I had my aura read. The booth was simple and unassuming. Posters were handmade, and a small man in a white robe staffed the booth. On the table was a laptop, and a device that had what looked like two metal handprints on it. The poster told me I could have my aura read for $5 (Normally $15! Show Special!) I know the most colorful things about myself are 1) my shoes and 2) my language. But for $5…why not, right? Not a bad price for entertainment. So I entered the booth and the man wiped off the metal handprints. He instructed me to put my hands on the metal shapes, making full contact with them, and relax…. Well, yay, my soul isn’t black. That’s good, right? I mean, I’m mildly disappointed I don’t feel tingly, or see unicorns, but…. He went on to tell me that I needed to do some work on listening to my heart and allowing it to speak. He said that I would too often overthink things, and my mind would talk my heart out of doing what it wanted to do. Curious. I’m sure he had no way to know that I keep myself up at night with the thoughts and voices in my head. He had no way to know that I had just recently committed to getting WELL this year, to work on myself on the inside, and that I trip myself up over and over again. Or maybe the furrows between my brows and the tension in my shoulders gave him the clues he needed. Regardless, it was an interesting reading. And I’ll take the validation. I like the idea that the work I’ve recently committed to do is in line with what I’m meant to be…that I’m some sort of spiritual butterfly that needs to work on nourishing my soul so I can grow strong wings instead of reminding myself that I can’t possibly ever fly. I’ve been building this cocoon since I was ten years old. That’s over thirty years of powerful work to undo. It’ll take a while, and I suspect that I’ll squint and wince once the first bright light hits my eyes. It takes time to adjust as you grow. But I’m looking forward to my first flight; even if I crash-land in epic fashion, it’ll be a heck of a ride while I soar. This entry was posted in General Thoughts, Personal Recovery and tagged anxiety, food issues, mental health, spirituality by KatieComeBack. Bookmark the permalink.